INDIANAPOLIS — An internship can give a leg up for an applicant in the hiring process when applying for a job. However, finding the right company can be difficult. 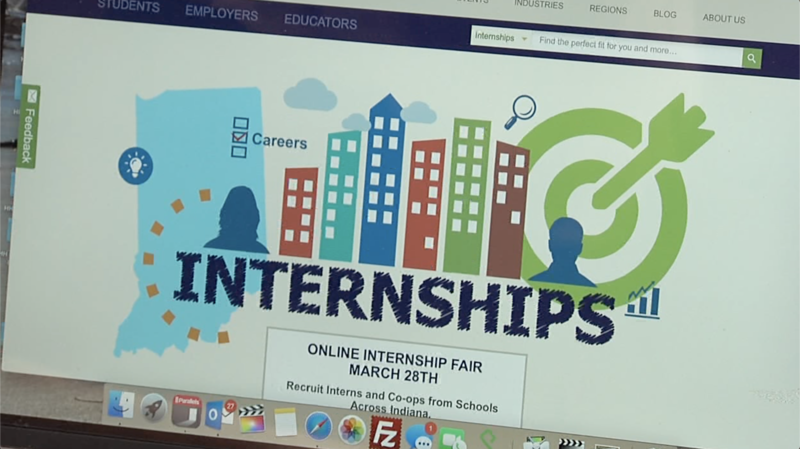 The Indiana Chamber of Commerce manages an online internship portal matching Hoosier students to Indiana Companies called Indiana INTERNnet. "One hundred percent of the time, any experience when hiring full-time is better than no experience," Becca Harrison, the talent acquisition supervisor at Protective Insurance in Indianapolis, said. Harrison started at Protective Insurance as an intern herself and knows firsthand what kind of resume employers are looking for when hiring new employees. "Today, in my role, I hire a lot of full-time employees," Harrison said. "And I know fresh out of college, when we look for new college grads, we understand that they won't have a ton of experience, but those who did take the time to do the internships and really build their skill set are really ahead of any of the other students who maybe didn't take the time to do that." Protective Insurance has a robust intern program, where 50 percent of their interns become full-time employees at the company. The insurance company is one of nearly 1,000 Indiana employers using Indiana INTERNnet. "Internships are incredibly important," Harrison said. "You go to school to learn all of this information and gain this knowledge, but it is so different being able to put it into real-world applications." Indiana INTERNnet is a one-stop shop for the internship search. It has a searchable database, a matching system, and personal assistance with a hotline to answer questions. Once an applicant lands an internship, there is internship guidance and resource materials to succeed on the job. "These days the need is all that more important because employers in particular are just crying for talent," Mike Slocum, the Executive Director of Indiana INTERNnet, said. Slocum said in 2018 more than 800 Hoosier students used the site to place them into companies across the state. "Everything is Indiana-based, specifically our job is to be the catalyst for talent in Indiana, so all of our focus is on Hoosiers," Slocum said. "A lot of Indiana students don't know the employers that are in their own backyard. They may know some of the big names, but lots of small- and medium-sized business that would be great fits for them, they just wouldn't know about." Indiana INTERNnet had more than 3,000 internship postings from more than 940 employers in 2018. There are a wide range of positions available for high school students, college students, and adults looking to break back into the workforce through a "return-ship."